All theme and plugin purchases include a single license key, registered to the customer who purchased the theme. You must activate your license key in order to receive any theme and/or plugin updates. Once activated, these update notifications will appear directly in your WordPress dashboard, usually as an orange numeric notification under the Dashboard > Updates tab. Read on for how to activate theme licenses. 1. From your WordPress Dashboard, navigate to Appearance > Theme Name: Getting Started. Older versions of our themes may navigate to the license activation page by going to Appearance > Theme License. 2. In the License Key field, enter the string of letters and numbers sent to you in your original purchase receipt, which correspond to the theme license key. Click Save Changes. 3. Hooray! 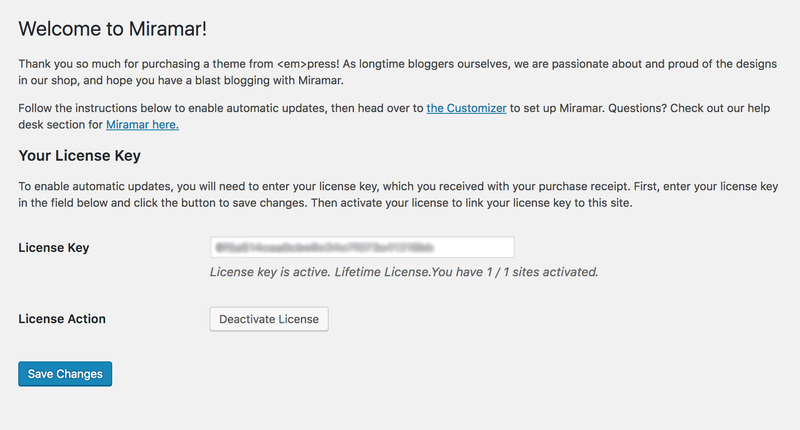 Your theme license key has now been activated, and you should receive update notifications via your WordPress dashboard. Now, when new updates are available for your theme, you will see a notification here. Note that this main Updates tab may also include update prompts for plugins or old themes that you no longer have in use.